In May of 2016, when he was 8 years old, Tomato suddenly became very ill. He had significant fever of 105.5 degrees (101.5 is normal for cats), as well as being dehydrated, lethargic and not eating. Since he had been a patient at the Cat Clinic of Chattanooga for his previous routine veterinary care, his owner took him there seeking help despite knowing that his treatments would likely exceed what she would be able to pay. Because she is self-employed as a professional gardener, Tomato’s owner’s work is seasonal and depends upon her good health and physical capabilities. She had recently been ill herself, had missed a couple of weeks of work and was recovering from surgery. She was also just coming off a slow winter season in her business which further reduced her income. When we told her about the Alice Fund, she was very happy to learn that she might get some financial assistance to help with Tomato’s medical care as she was very worried about him. She also offered to donate back to the Fund when her financial circumstances improved. In order to keep costs as low as possible, the veterinarian at the Cat Clinic treated Tomato as an out-patient. His owner brought him in for rechecks and fluid therapy every day or two and gave him his prescribed medications and encouraged him to eat at home. She was also able to use some medications that had been donated by other caring clients whose cats no longer needed them. All in all, Tomato was sick for a little over a week, but when his condition began to gradually improve from day to day, we knew that he had a good chance at full recovery. Since the Cat Clinic is one of several area veterinary offices that offers discounts to clients who have been approved for help from the Alice Fund, Tomato's medical bill was reduced from just over $400 to a little over $200. An anonymous donor who learned of this owner’s need contributed $100, and the Alice Fund covered the rest. A couple of months later, we checked in on Tomato, and he was doing great. His owner, fulfilling her voluntary commitment to contribute back to the Alice Fund, made a donation of $250 so that the Fund can continue to help provide medical care for other cats in need. It was a cold December day when Mandie, who already has three cats and a dog of her own, had to stop her car suddenly to avoid hitting the small calico kitten wandering aimlessly by the roadside. When she approached to assess the situation and get the kitten out of harm’s way, she realized that Darlene, as she came to be named, couldn’t see. Her eyes seemed small, and they were matted shut with yellow discharge. She was very friendly, though, and seemed to appreciate having a kind person stop to help her. Unsure what to do with a sick stray kitten, Mandie interrupted her errands and drove straight to the Cat Clinic of Chattanooga where her three cats receive their medical care. When the veterinarian examined Darlene she found the kitten’s fur had been shaved all over and her whiskers had been cut short. Darlene also had signs of severe upper respiratory and eye infection. Her left eye was closed completely, and the socket was sunken. Her right eye was barely open, and there was so much discharge and cloudiness that the globe of the eye could barely be seen. Both Mandie and the kitten clearly needed help, so the doctor offered to keep Darlene at the Cat Clinic until her medical situation could be fully assessed and treatments started to address her health problems. Mandie, the doctor and the clinic staff also began to make a plan to find a safe and permanent home for this kitten in need. With time and the right medications and nursing care, Darlene’s respiratory infection cleared, and she was examined and treated by a Board certified veterinary ophthalmologist. Unfortunately, both of her eyes had been so badly damaged that they needed to be removed to help prevent future complications. Another local veterinarian agreed to do these surgeries at a significantly discounted price, and she spayed Darlene at the same time. 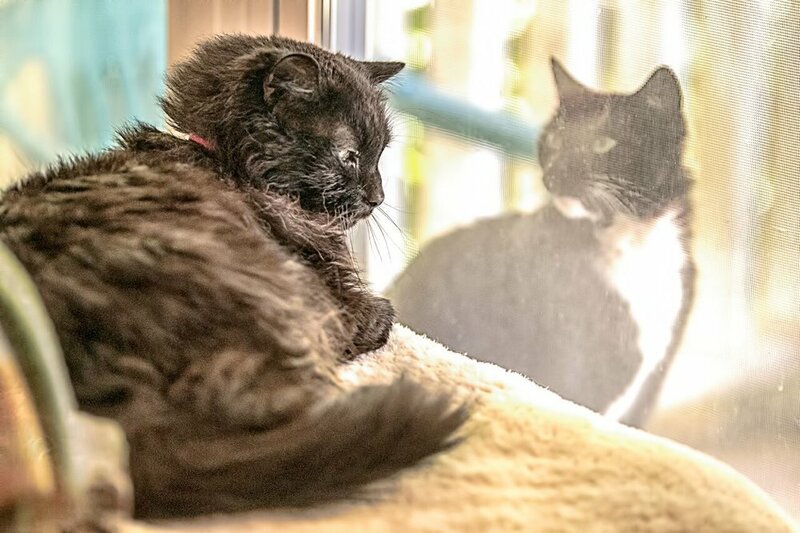 Darlene’s recovery at the Cat Clinic was quick, and then came the best news of all—Darlene went to her new forever home. She was adopted by a wonderful family who has had blind cats before and so understands their special needs. She has children, other cats and a dog to play with and lots of love and attention. Many people were involved in helping Darlene along her path from illness and homelessness to health and a family. Over $700 in private donations from seven different donors went toward her medical costs, and her surgeries were discounted by almost $250, not to mention the services of the veterinary ophthalmologist which were given at no charge. The Alice Fund, with the help and generosity of its supporters and contributors, will cover the remaining medical bills. Thanks to everyone who came together to help this kitten in need, Darlene can now look forward to a happy and healthy future in her new home.